قربانی, مریم, کاکی, روژین. (1395). بررسی رفتار فیزیکی چوب پلیمر استایرن در غلظت‌های مختلف مونومر. مجله صنایع چوب و کاغذ ایران, 7(2), 231-239. مریم قربانی; روژین کاکی. "بررسی رفتار فیزیکی چوب پلیمر استایرن در غلظت‌های مختلف مونومر". مجله صنایع چوب و کاغذ ایران, 7, 2, 1395, 231-239. قربانی, مریم, کاکی, روژین. (1395). 'بررسی رفتار فیزیکی چوب پلیمر استایرن در غلظت‌های مختلف مونومر', مجله صنایع چوب و کاغذ ایران, 7(2), pp. 231-239. قربانی, مریم, کاکی, روژین. بررسی رفتار فیزیکی چوب پلیمر استایرن در غلظت‌های مختلف مونومر. مجله صنایع چوب و کاغذ ایران, 1395; 7(2): 231-239. در این پژوهش اثر غلظت‌های مختلف مونومر حفره‌ای استایرن بر خواص فیزیکی چوب راش ایرانی بررسی گردید. نمونه‌های آزمون فیزیکی بر اساس استاندارد ASTM-D1037 تهیه گردیدند و به روش خلا-فشار، در پنج سطح غلظت0، 40، 60، 80 و 100 درصد از مونومر اشباع شدند. پلیمریزاسیون مونومر تحت اعمال دما در آون در دو بازه زمانی 24 ساعته، به ترتیب در دمای 90 و 103 درجه سانتی‌گراد انجام‌شد. جذب مونومر و پلیمر، تغییرات دانسیته، جذب آب، واکشیدگی و اثر ضدواکشیدگی اندازه‌گیری شد. بر‌اساس نتایج با افزایش غلظت، جذب مونومر و پلیمر افزایش یافت و در بالاترین سطح، جذب مونومر و پلیمر به ترتیب 288/38 و 26 درصد گزارش گردید. با افزایش جذب پلیمر، دانسیته چوب از g/cm³ 0/36 در نمونه شاهد به g/cm0/91 در بالاترین سطح غلظت مونومر افزایش یافت که به کاهش فضای خالی در ساختار چوب‌پلیمر منجرشد. افزایش سطح جذب پلیمر، آب‌دوستی و تغییرات ابعاد نمونه‌های تیمار شده را کاهش داد، به طوری‌که پس از طولانی‌ترین زمان غوطه‌وری، جذب آب و واکشیدگی‌حجمی نمونه اشباع شده با مونومر به غلظت 100درصد، در مقایسه با نمونه شاهد، 64 و 3/45 درصد کاهش یافتند. بالاترین کارایی ضدواکشیدگی نمونه‌های اشباع شده با مونومر استایرن نیز، 157/56 درصد در بالاترین سطح غلظت گزارش گردید. Mohebby, B., 2003.Wood and lignocellolusic material modification and their technologies. First national conference of cellolusic material processing and applying.Tehran University, 405-410. Sjostrom, E., 1993. Wood Chemistry Fundamentals and Applications; Academic Press: San Diego, 293 p.
 Abdolmaleki, J. and Omidvar, A., 2003. Evaluation of composite products, WPC prepared using styrene monomer species Populusnigra direct heat method. 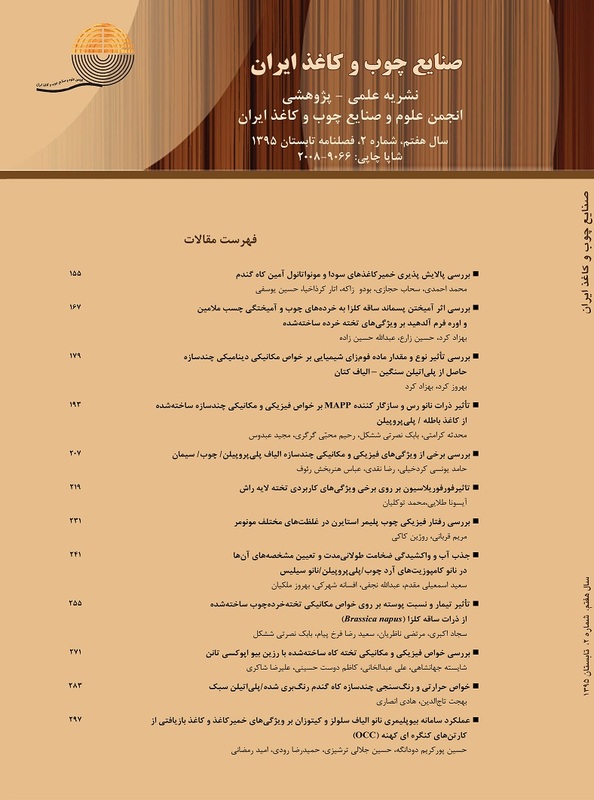 Journal of Gorgan University of agricultural sciences and natural resources, 9(4): 215-221. Baysal, E., Yalinkilik, M. K., Altinok, M., Sonmez, A., Peker. H. and Colak, M., 2007. Some physical, biological, mechanical, and fire properties of wood polymer composite (WPC) pretreated with boric acid and borax mixture. Construction and Building Materials, 21: 1879–1885. Lande, S., Westin, M. and Schneider, M., 2004. Properties of furfurylated wood. Journal of Forest Research, 19(5): 22-30. Zaheditajrishi, A. and Omidvar, A., 2007. Resistance of Poplar wood polymer composites against Coriolus versicolor fangus. Journal of Agricultural Science and Natural Resource,14(1): 81-90. Omidvar, A., 2009. Wood-Polymer Composite. Gorgan University of agricultural sciences and natural resources, Gorgan, 127pp. Li, Y., Dong, X., Lu, Z., Jia, W. and Liu, Y., 2012. Effect of polymer insitu synthesized from methyl methacrylate and styrene on theorphology, thermal behavior and durability of wood. Journal of Applied Polymer Science, (10):1-8. Schnieder, M.H., Brebner, K.I. and Hartley, I.D., 1989. Swelling of a cell- lumen filled and wall bulked wood- polymer composite in water. Wood and Fiber Science, 23(2): 165-172. Kaki, R. and Ghorbani, M., 2013. Investigation on the water absorption and dimensional stability of beech impregnated with methyl methacrylate. Journal of forest and wood products, 6: 329-338. Lawniczak, V.M., 1994. Method of production of the composite Bamboo polystyrene elaborated in poland. Paper presented on international bamboo festival and national Bamboo convention 1, Bandung, Indonasia. Devi, R. and Maji, T. K., 2006. Effect of Glycidyl Methacrylate on the Physical Properties of Wood–Polymer Composites. Polymer Composite, 28(1): 1-5. Li, Y., Liu, Y., Wang, X., Wu, Q., Yu, H. and Li, J., 2011. Wood-Polymer Composites Prepared by In-situ Polymerization of Monomers within Wood. Journal of Applied Polymer Science, 119(6): 3207–3216. Schnieder, M. H. , 1994. Wood -polymer composites. Wood Fiber Sci, 26(1): 142-151. Zhang, Y.L., Wan, H. and Zhang, S.Y., 2005. Characterization of Sugar MapleWood-Polymer Composites: Monomer Retention and Polymer Retention. Holzforschung, 59: 322-329. Talaeepour, S. and Omidvare, A., 2008. Investigation of physical properties wood polymer composites from palownia, aspen, maple, hornbeam speiec. Journal of Pajouhesh and sazandegi, 78: 86-91. Chao, W.Y. and Lee, A.W., 2003. Properties of Southern pine wood impregnated with styrene. Holzforschung, 57(3): 333-336. Fruno, T., 1991. The role of wall polymer in the dimensional stability and decay durability of wood-polymer composites (wpc). Proc. Int. Symp. On chemical modification of wood, Kyoto: 160- 165.Japan.